In 2010 I was drawn for the first time for a bull elk rifle tag. I had total confidence that my Browning A-Bolt in .30-06 would be strong enough “medicine” for bull elk. 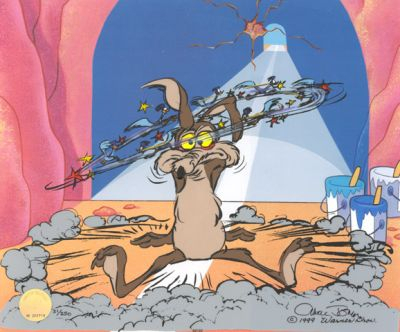 But being an un-rehabilitated rifle nut, I wanted to celebrate my good fortune of drawing by getting a new rifle of even stronger medicine, for “insurance.” I don’t need a good excuse, or even any excuse to buy a new rifle . Even six years ago, my Remington Model 600 fever was strong. My first choice was to look for an original M600 in .350 Remington Magnum. The trouble was that I didn’t have an extra $1000+ available, which is today’s going rate for the classic M600 Magnum. However, the Remington Model 673s had fairly recently bombed in the marketplace. The M673 was a dressed up Model 7 with vent rib, shark fin front sight, and laminated stock, reminiscent of the original M600s. They were made in .350 Rem Mag and other calibers. They were still available as new old stock and on the used market at the time for around $500 to $600. I did find one at a gun show, but the seller had a Leupold scope mounted on it that he would not separate, so his price was up there in the $1000 range. I haggled with him for a while, but I just could not close the deal. Sometime after that, I found myself at Cabela’s looking over a Browning X-Bolt Hunter in caliber .325 Winchester Short Magnum. The .325 WSM was introduced a few years earlier, as the largest member of the WSM family. But like the Remington M673, the .325 WSM did not find love in the marketplace. The .325 WSM is really an 8mm cartridge – actual bullet diameter is .323”. The 8mm bullet diameter has not been a popular one in the American market, neither in the form of the 8mm Mauser, nor the 8mm Remington Magnum. I think that is the reason that this particular X-Bolt was marked with a very reasonable price tag on it. The X-bolt today is Browning’s flagship bolt action rifle. A price of around $800 is average for the plain Hunter model. On the day that I found this one at Cabela’s, it was priced just under $600. You know how much I love my Browning A-Bolts. I had no experience yet with the X-Bolt. It would be good to see why my beloved A-Bolts were being phased out. And because it was chambered for that “stronger medicine” that I was looking for, of course it came home with me. The X-Bolt was introduced by Browning in 2009. At first, A-Bolts were still offered right alongside the new X-Bolts. But as time has passed, fewer and fewer A-Bolts were cataloged, as more and more variations of the X-Bolt were introduced. As I write this, the only A-Bolts still offered are the Medallion model in 7mm Rem Mag and in the .264 and .300 Win Mags; plus the left-hand Stainless Stalker is available in .270 Win, .30-06, and .300 Win Mag. The X-Bolt on the other hand is now offered in well over a hundred variations including many caliber choices. My X-Bolt is the satin finished walnut stocked Hunter model with black satin metal finish. Browning X-Bolt on the left, A-Bolt on the right. One of my favorite features on the A-Bolt is the detachable magazine that is attached to the swing down floor plate. This allows you to easily top off the magazine with the bolt closed. While holding the rifle in your left hand (I’m right handed), just pop down the floor plate with your right hand and press another round or two into the mag. Then swing the floorplate back up until it latches. The mag just clips to the floorplate which makes unloading easy. To me, the detachable magazine that presses into the bottom of the stock is a step backward on the X-Bolt. The X-Bolt uses a detachable polymer magazine. Its release latch is at the front of the magazine. Activating the mag release pops the magazine free into the palm of your hand. However, topping off the mag involves putting the rifle down so that you can press new rounds into the mag with one hand while it rests in the palm of your other hand. The first accessory I purchased for the rifle was a second mag, so that I could always keep a second full mag in my pocket for quick one-handed reloads in the field. The magazine is a rotary feed type of magazine. The top round is always presented at the top center of the mag, so feeding is quite smooth. For WSM chamberings, the mag holds three rounds. The mag holds four rounds of standard hunting calibers such as the .30-06 and the .308. Another of my favorite A-Bolt features is the short bolt lift due to a three-lug bolt. This was retained on the X-Bolt. I also love the smooth, flattened, “lozenge”-shaped bolt knob which is twisted about 45° to the long axis of the rifle. Operating the bolt, palm facing upward then pulling back, is very comfortable due to the ergonomic shape of this bolt knob. Why has no other rifle maker ever figured this out? This feature was also retained on the X-Bolt. One thing I saw right away about the X is that there is noticeably less metal in the receiver and bolt. This makes the X-Bolt overall lighter and slimmer than the A-Bolt. There is less metal everywhere, from the bolt handle shaft, to the bolt itself, to the receiver walls and roof. The X-Bolt takes its name from the “X-Lock” scope mounting system. 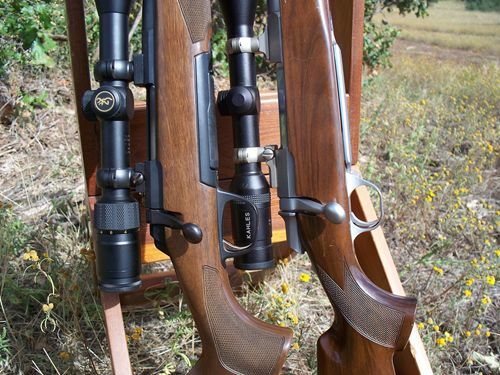 Instead of the usual two screws on the centerline for scope ring mounts on the top of the receiver, the X-Bolt uses four screw holes toward the sides of the receiver top. Marketing hoopla aside, the real reason for this is because the metal in the receiver roof has been so thinned for weight reduction, that there simply is not enough meat left in the centerline for screw security. By moving the screw holes to the sides, they take advantage of the extra meat where the vertical receiver walls start. The result is an exceptionally secure scope mounting system due to the doubling of attachment points. A major new feature that I love on the X-Bolt is the bolt unlock button. I’ve mentioned before that I cannot use a rifle that does not lock the bolt handle with engagement of the safety. In the field I carry my rifle slung over my left shoulder with the barrel up. This puts the bolt handle into my left side, right where the shoulder strap of my daypack is. When walking, the daypack strap is right there constantly tugging on the bolt handle. If the bolt was not locked, in a very short time the daypack strap will yank open the bolt, then the bolt will fall open and eject the chambered round – likely to be un-noticed by me. I need a rifle that locks the bolt with the safety. The problem with that is to unload the rifle, the safety must be disengaged to open the bolt to remove the round. That’s not a real big deal. You just make sure that the rifle is pointed in a safe direction in case the rifle should somehow decide to go off during this operation. This should never happen with a properly functioning fire control system. It has never happened to me, but the possibility exists. Browning has solved this perceived problem on the X-Bolt by providing a separate bolt-unlock button at the top of the bolt handle root. The rifle’s safety may be kept engaged, then the bolt unlock button is pressed to allow the bolt to be lifted and retracted to unload the rifle. Very nice. The trigger safety is a two position sliding button located on the tang behind the bolt shroud. This is hands-down, my favorite place for a rifle safety. Slide forward to disengage, exposing a red dot off-safe indicator. The X-Bolt was introduced with a new three-lever trigger that they call the Feather Trigger. There is no Glock-like embedded trigger safety on this trigger. It looks like just a plain traditional hunting rifle trigger. The magic is all on the inside to create an extremely crisp and clean break with no perceptible over travel. It is factory set to about 4 pounds. It is adjustable, but only to about 3 pounds minimum. I’ve adjusted mine to the minimum. 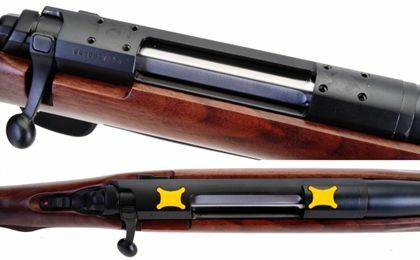 In standard calibers, the Hunter model sports a 22” long barrel. In the WSM chamberings, the Hunter barrel is one inch longer at 23”. A new recoil pad was also introduced with the X-Bolt. Browning calls it the Inflex recoil pad. 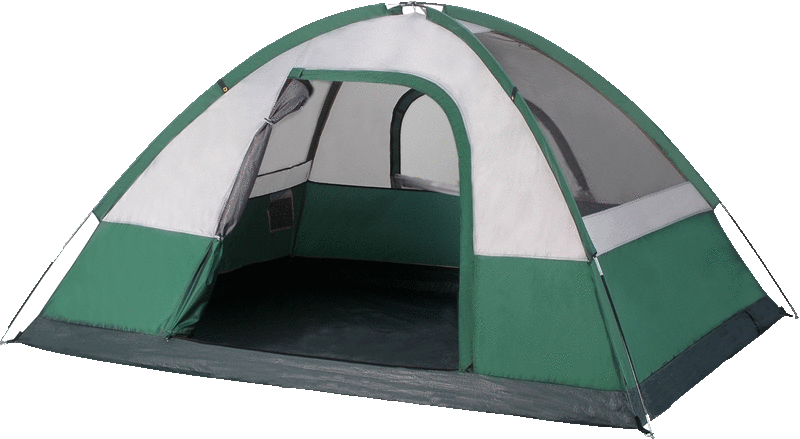 It is made of a relatively soft rubber with collapsible air chambers on the inside. The internal ribs that separate the chambers within the recoil pad are angled so that during recoil, the pad collapses in a direction which tends to pull the stock downward, away from your cheek. Overall it is as effective as a Pachmayr Decelerator, but better due to the way it pulls the stock away from your cheek bone. As the .325 WSM is almost as powerful as the under-appreciated 8mm Remington Magnum, the recoil reduction of the Inflex recoil pad is much appreciated. My rifle does not have a muzzle brake. 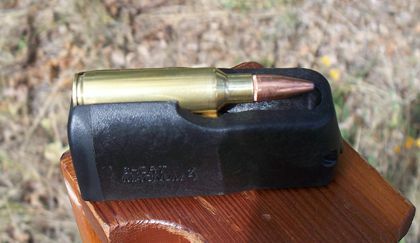 Why did I not seek out a .338 Win Mag, the acknowledged go-to big bull elk cartridge? Frankly, because I am intimidated by the .338. I am not, and have never been a fan of heavy recoil. I used to have a Sako 7mm Remington Magnum that I tried at full power a few times and would see stars and hear cuckoo birds every time I pulled the trigger. Ow! From then on I downloaded it to use lighter bullets and lighter powder charges so that I could tolerate it. Effectively, I turned it into a hot .280 Remington. But I had read some good things about the .325 WSM. It was supposed to be quite tolerable for recoil while hitting nearly as hard as the .338 Win Mag. I was intrigued. The .325 was the fourth, and so far final Winchester Short Magnum cartridge introduction. Winchester started the WSM ball rolling in 2001 with the introduction of the .300 WSM. In 2002, Winchester followed up with the introduction of both the .270 WSM, and the 7mm WSM cartridges. The WSMs went quiet for a couple of years, as Winchester went off to introduce the Winchester Super Short Magnums in .223, .243, and .25 WSSM chamberings. After an initial flurry of interest, it appears that the WSSMs have flopped. 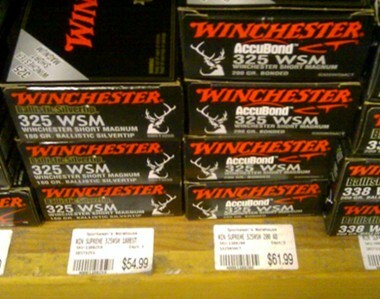 But in 2005, Winchester announced the .325 WSM, taking the market by surprise. Everyone thought that if Winchester were to introduce a bigger WSM, that it would be a .338. But a funny thing happened. It turns out that they could not achieve ballistic parity to the .338 Win Mag with a .338 WSM. Their aim with the WSMs was to be able to claim approximately equal performance to the standard magnums already in the market, but in a short action cartridge length. When they could not match the .338 WM, they backed off and tried the 8mm bore size. Bigger, but different. Even though the .338 can throw like-weight bullets about 100 fps faster to start, the slightly smaller 8mm bore size generally allows a higher ballistic coefficient. That allows the .325 to catch up to the .338 energy-wise at extended ranges, while closely matching trajectory. Nevertheless, the .325 WSM is certainly a lesser cartridge than the .338 Win Mag. 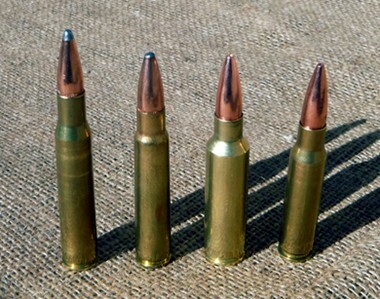 The .325 tops out with 220 grain bullets, while the top end of the .338 for hunting bullets is around 250 grains. .338 bullets up to 300 grains are available, but these are generally used in the .338 Lapua Mag, not the Win Mag. But of course we are splitting hairs here. If hit well, no big bull will ever know the difference between a .300 Win Mag, a .300 WSM, a .325 WSM, an 8mm Rem Mag, a .338 Win Mag, or a host of other cartridges in this class. I just like to mess with some of the more obscure cartridges because being different is fun. In a couple of years when the rest of the world realizes the greatness of the .325 WSM, I guess that I will have to move on to something else! 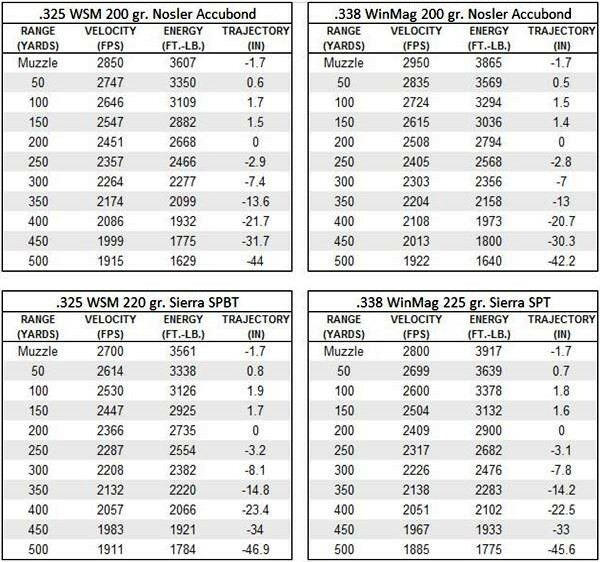 Physically, the overall length of the .325, like all the WSMs, is about the same as the .308 family of cartridges, allowing them to be used in handy and light short-action rifles. It’s quite a bit fatter than the .308 though. On the lighter end, excellent bullets in 150, 160, 170, and 180 grain weights are available in the 8mm bore size. This makes the .325 not-unreasonable for antelope and deer. The .325 does not have to be reserved just for the largest North American game. In fact, it has displaced my old favorite .30-06 in the gun safe. Because of the .325’s flexibility, I ended up gifting the .30-06 A-Bolt to my son Sam. You can throttle the .325 down into .30-06 territory, or throttle it up into the .338 Win Mag realm. But there is a downside. You don’t see prices like below for 20-round boxes of .30-06 ammo! This is not the caliber for you if you do not hand load, unless you are rich. Mauser, .325 WSM, .308 Win. Sticker shock! Who can afford to shoot .325 WSM? Loading the .325 is straight-forward. You don’t need to use the slow magnum powders. It likes all the same powders that you would use in a .30-06. My favorite is H4350. It just uses a little more of it, that’s all. 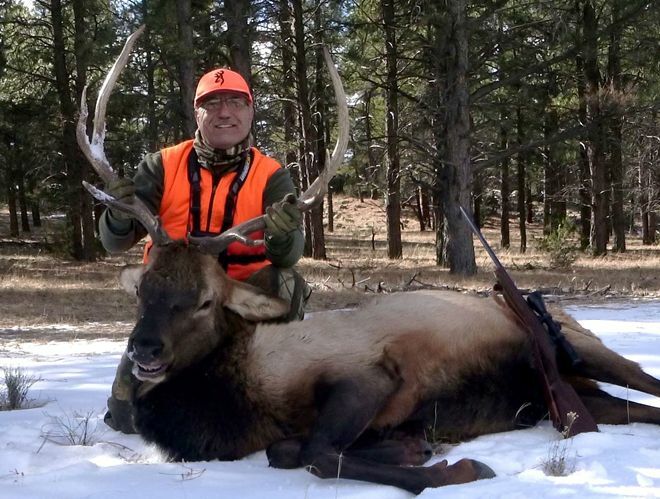 My 2010 bull elk hunt was not successful. My sons tagged along for the first weekend of the hunt, and we did catch sight of a big daddy. When I tried to get close enough for the shot, he gave me the slip. I took the rifle out a couple times after that on cow elk hunts, only to again be skunked. My luck changed in 2015. For only the second time, I was drawn for a bull elk tag. What’s more, I put in on the application with my son Ben. We would be hunting bull elk together! The hunt dates started on the day after Thanksgiving. We headed up early on Thanksgiving morning. In another story I mentioned that upon getting the news that we were drawn, I ran out and bought a small camping trailer, knowing that temperatures in elk country would be downright cold at this time of year. It was early afternoon when we finished setting up camp. Temps were in the 40’s. Our first order of business was to get a good camp fire going. Ben has become quite a good cook. He loves exploring all kinds of new dishes that he never had while growing up. Our next task would be coming up with a Thanksgiving feast while out camping in the wild. We didn’t go fancy on the turkey. We just had a pre-cooked turkey breast that Ben warmed on the campfire. Then we had cranberry jelly out of the can. Easy stuff so far. I cooked a buttery red potato and corn dish using the wood-burning Biolite Camp Stove and its Kettle Pot. On the camper cooktop, I made Stove Top Stuffing. Ben also cooked up bannock bread in a cast iron skillet on the camp fire. For dessert, he cooked a strawberry- rhubarb cobbler in a Dutch oven, again in the camp fire. Since it was just the two of us, we feasted quite hearty! We were hunting the area where I had taken my cow elk the year before. On that hunt we had seen plenty of bulls. I knew where I wanted to start on opening morning. We took the truck a little over a mile away from camp to start our hunt. The trouble was that there were already two other trucks parked there. Oh, oh. I decided that wearing my orange vest would be a good idea. Shortly after walking off into the woods, we heard the sounds of not-too-distant gunfire. We headed off toward “Elkland” park, where we would sit for a spell. We kept hearing more gun shots. I turned to Ben and said, “I sure hope that they leave some for us!” Eventually we got antsy, picked up our stuff and headed onward to the next park. As we sat down on a log there, a few minutes later, here comes a truck driving by. On my cow hunt, I was one out of only 20 tags for that week. It was a very nice hunt because I never saw another elk hunter. This was totally different. Boom! Boom! More gunshots. So we picked ourselves up again and started wandering towards another small park that I knew about. We arrived to this third park around 10:00 am. Temps were still in the 30’s. I wanted to find a warm place to sit in the sun. I spotted a sun-facing tree trunk and told Ben, “I’m gonna go sit over there. Where are you gonna sit?” He picked another tree about 25 yards to my left and a little behind me. That sun on my face sure felt good. It felt so good that I dozed off. I awoke and opened an eye to look around. All was quiet. I closed my eyes and dozed off again. When I next awoke to look around, I was presented with the gift of a decent bull standing across the park in front of me, in the middle of a patch of snow less than 100 yards away! Does Ben know about this bull? I turned around to see if Ben was already aiming on this elk. Ben seemed to be looking down at something in his lap. I found out later that he was playing some video game. Kids! I reached beside me to grab the X-Bolt that was leaning against the tree. I quickly, but quietly chambered a round, aimed and fired! As is often the case with elk, this boy didn’t know yet that he was dead. I jacked in a second round and fired. The elk teetered and went down! I looked over at Ben again and now I see him aiming his rifle. Huh? Then, I saw a second bull burst out of the trees and run across the park in front of us! But Ben never pulled the trigger. He was hoping that the bull might slow or stop for a surer shot, but the bull just kept going. My bull turned out to be a 5x4 with decent mass for a rack of that size. Not a monster, but a very satisfying first bull. The load was the 200 grain Barnes TSX at around 2820 fps. I think that I will hang on to this rifle for a while.